Just when I thought San Diego was safe from the Pinkberry craze which has seemed to taken hold of Los Angeles and surrounding areas, I was wrong. The former P.B. 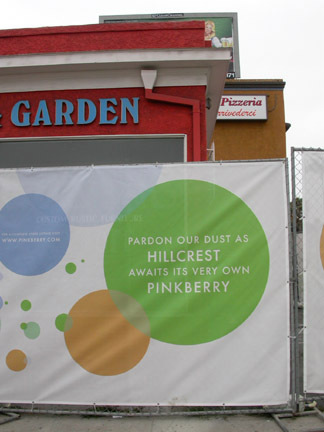 Home & Garden on the corner of Robinson and 4th Ave., almost smack dab in the middle of trendy Hillcrest, is being renovated into a Pinkberry! Pinkberry serves designer frozen treats in original plain tart and green tea flavors as well as a variety of smoothies and shave ice. Although previous Pinkberry claims to have the benefits of real frozen yogurt that has changed recently. No real yogurt can be found in the product offered and the company had to remove any wording regarding ‘yogurt’ in all it’s materials. No opening date has been announced or whether more San Diego locations will open. But it will be interesting to see how locals respond to this L.A. trend. Personally, I don’t think Yogurt World or Yogurtland have anything to worry about. I was kind of hoping that the cupcake trend would drift south. Ha ha! You will succumb to the joys of smooth creaminess, San Diego!In all seriousness, I have a weird feeling Pinkberry (Like Pinky and the Brain) are planning to take over the world. there to easy to copy to take over the world, why do you think there is all these new berries places popping up everywhere? Hey Darlene – Maybe they'll still be selling hardware…could it be that PB Home and Garden stands for P(ink)B(erry) Home and Garden? LOL! Pinkberry is spreading like wild fire. I recently went to the grand opening of Red Mango you can see my take at my site: Froyomind I have this feeling that Pinkberry is over franchising just to milk it while they can. 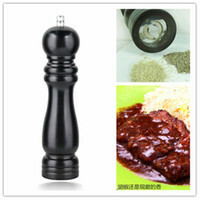 Hi Spoon–Thanks for the link. It's good to know there's a blog watching the froyo trend out in Southern California. I'll check in often. When is the San Diego Pinkberry opening?! 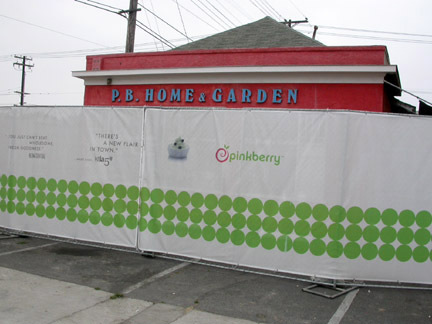 For Christ's, sake… it's October 2007 and they haven't even started construction/remodel of the old PB Home & Garden. Does anyone know what's up? Anyone know what's going on with San Diego's Pinkberrys?